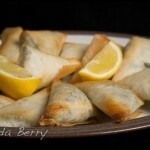 These spinach and feta pastries are a delicious treat for any day of the week! 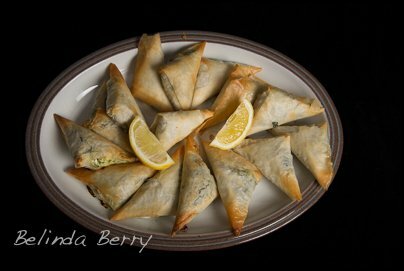 Spanakopitta is a Greek name for spinach and cheese pastries. Because filo pastry is fat free, you can get the lovely crispness of pastry without loads of calories. 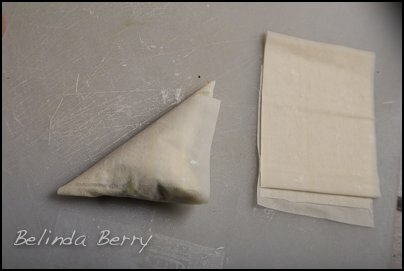 They are not difficult to make as individual triangles, but if you prefer you could make one large pie using the four sheets of pastry overlapping each other. Heat 1/2 tblsp oil in a frying pan and gently sauté the shallots or onion until softened but not coloured. 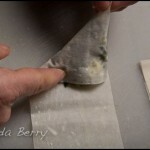 Wash the spinach well and put into a saucepan with the water that clings to it. 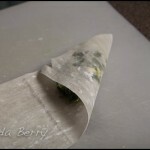 Cover and cook gently until tender. Strain through a sieve, pressing out all the liquid, then turn out onto a board and chop roughly. Add the shallots, feta cheese, beaten egg, coriander leaves, freshly grated nutmeg and black pepper and mix well. 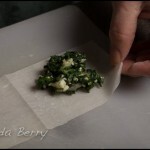 Work with one single sheet of filo pastry at a time, keeping the remainder wrapped up. 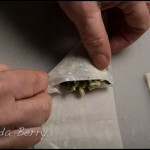 Cut the sheet of pastry into 4 equal strips. 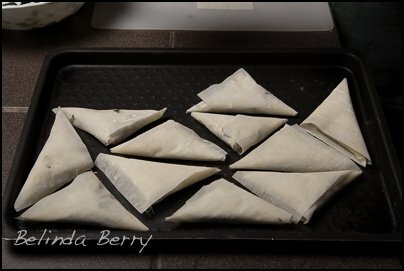 Add a spoonful of spinach mixture at one end and turn into triangles. 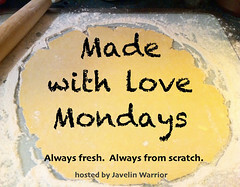 Put onto a lightly oiled baking sheet. 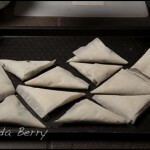 Continue until the mixture is used up - should make 16. 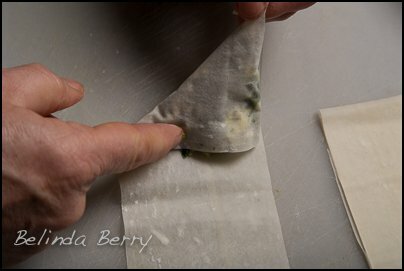 Brush the outside of the pastries very lightly with olive oil. Serve with a mixed salad with black olives. Each Spanakopitta is 50 calories (kcals). 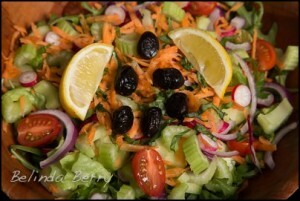 A serving of 4 with mixed salad and a balsamic dressing would be under 250 kcals. 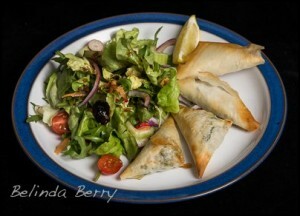 This entry was posted in Recipe, Starters and tagged coriander, feta cheese, filo pastry, Greek, spinach by Belinda Berry. Bookmark the permalink. Thank you for this. The recipe was perfect for the amount of cheese I had. 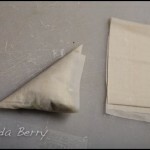 I made the full wider to allow for my clumsy wrapping. Also, I used a tablespoon of dill since I didn’t have coriander leaves. They were delicious! Thanks again.